2018 Yamaha XMAX (CZD300JW) for sale in Bay City, MI. Stevens' Sports Center & Stevens' Cycle Sales Inc.
Monday Parts and Sales 9:00 a.m. 7:00 p.m.
Monday Service 9:00 a. m. 6:00 p. m.
T-W 9:00 a.m. 6:00 p.m.
Thursday Parts and Sales 9:00 a.m. 7:00 p.m.
Thursday Service 9:00 a.m. 6:00 p.m.
Sun(PARTS AND SALES ONLY) 11:00 a.m. 3:00 p.m.
All-New Engine: The XMAX is powered by an advanced 292cc liquid-cooled, four-valve single that develops smooth, tractable power. The cylinder is crafted from Yamaha’s DiASil aluminum for excellent heat dissipation, with a lightweight forged piston and forged crankshaft. A counterbalancer ensures minimal vibration, while the offset cylinder layout and semi-dry-sump lubrication system help reduce friction and drag inside the engine. Anti-Lock Braking System: With large 267mm and 245mm front and rear disc brakes, the XMAX gives the rider controllable braking power backed up by the security of Yamaha’s anti-lock braking system, for confidence in all sorts of road conditions. Ready to Accessorize: Personalize your XMAX with a range of Genuine Yamaha Accessories, including luggage, accessory mounts, backrests and more. 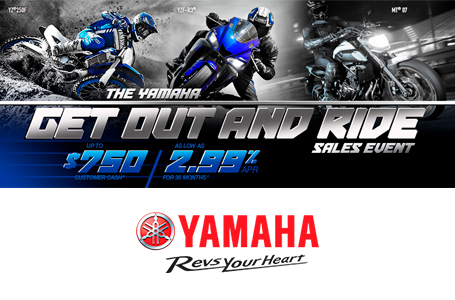 See the full range of accessories on www.ShopYamaha.com. L x W x H: 86.0 in. x 30.5 in. x 55.7 in. – 57.7 in. Rake (Caster Angle): 26.5 deg.